This potato gratin will make your kitchen smell like France. The recipe is from Patricia Wells's introduction to the cooking of French chef Joel Robuchon, Simply French. It's a fabulous and chunky book full of thoroughly home-cookable recipes with a little something extra - they might require a little more precision, a few more steps, a little more effort, and as a reward, they produce really wonderful food. This gratin, for example, tastes as elegant as saucy potato can: thinly sliced and soaked in chicken stock, smothered in a sweet onion and tomato sauce, garlic-studded, and topped with fresh herbs. It was everything my Sunday needed. The gratin could easily become vegetarian with the use of vegetable rather than chicken stock; grease the pan with olive oil, and toss the top potatoes in olive oil and parsley instead of butter, and it could make a delicious vegan main. And by the way, what is it about potato dishes that means photographs of them are so likely to look like they belong in a 1970s cookbook? Preheat the oven to 425°F / 220°C. Prepare the sauce: In a large skillet, heat 2 tbsp oil over a high heat. When hot, reduce the heat to moderate and add the onions. Cook until soft and translucent, about 5 minutes. Season and set aside. In another large skillet, heat the remaining 2 tbsp oil over moderately high heat. When hot, add the garlic and cook until just tender, 1 or 2 minutes. Be careful not to let the garlic burn, or it will taste bitter in the final dish. Add the tomatoes and cook until the mixture thickens, about 10 minutes. Add the sugar, and season. Combine the onions and tomatoes, and continue cooking to thicken, about 10 minutes more. Taste for seasoning. Meanwhile, prepare the potatoes: peel, wash, and cut the potatoes into very thin slices. Wash again and dry thoroughly. In a small bowl, set aside about one quarter of the potatoes, which will be used as the topping. Rub the bottom of an oval baking dish (about 9 x 13 inches) with the garlic and 1 tbsp of the butter. In a large bowl, combine the remaining potatoes with the sauce and toss carefully to blend. Transfer the mixture to a baking dish, smoothing it out with the back of a spoon. Add enough chicken stock to cover. In a medium-size bowl, combine the reserved topping potatoes, the remaining 1 tbsp butter, and the parsley. Toss to coat evenly. 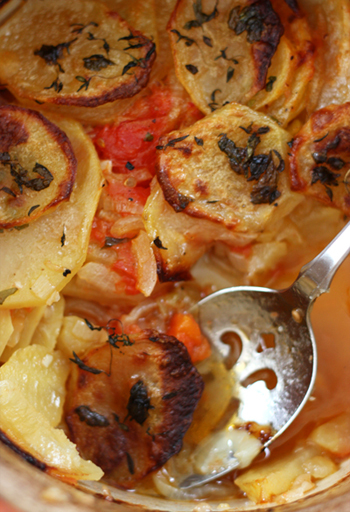 Beginning at one end of the dish, place the buttered potatoes, one by one, in slightly overlapping rows on top of the tomato-covered potatoes, until the entire dish is covered with an even potato layer. Sprinkle with the thyme. Place the dish in the centre of the oven and bake until the potatoes are soft, most of the liquid has been absorbed, and the top is golden, about 1.5 hours. Serve immediately. * How I peel tomatoes: bring a saucepan of water to a rolling boil. Prepare a bowl of cold water large enough to hold all the tomatoes. Cut a slit in the skin of each tomato from top to bottom, and drop them all into the boiling water. Leave them in the boiling water for approximately 1 minute before removing each tomato with a slotted spoon and placing it immediately in the bowl of cold water. As soon as the tomato is cool enough to touch, remove the skin, which will now slide away easily. You are so right about the 70's cookbook & potatoes, potatoes just don't seem groovy anymore. 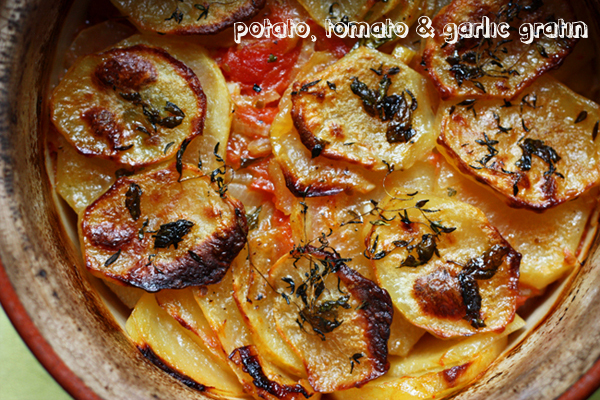 I love potato gratins but never thought of adding tomato..... Great idea, i'll definately try it. This sounds fantastic. I love potato dishes so much, especially gratins, that i am contantly looking for non-potato recipes... I think it's about time to make a gratin.